When you absolutely positively have to blow something up, accept no substitutes. Opt for a shoulder-fired grenade launcher. South Africa’s MilKor produces a fine example of the breed: the M32 semi-automatic shoulder-fired grenade launcher. At the risk of losing any claim of journalistic objectivity, the moment a MilKor company rep handed me a loaded M32 was one of the happiest moments of my life . . . The M32 fires 40mm grenades. The projectiles can be loaded with anything from chalk (like the practice rounds MilKor handed me) to high explosives to a Taser. The rotating cylinder acts like the cylinder in a revolver, holding six rounds of 40mm ammunition. The barrel consists of a 11.8 inch tube with internal rifling. Unlike standard revolvers, the M32 places a metal covering over the front of the non-firing chambers, keeping the expanding gases off the shooter’s forward hand. The MilKor M32’s is a manually-charged semi-automatic weapon. To load the M32, the user spins the entire cylinder 360 degrees, placing tension on a spring. As the gun fires, the spring advances the cylinder to the next unfired chamber. The lack of a recoil or gas operated action means that there is no method for resetting a single action trigger, so double action it is. The MilKor M32 MGL’s go-pedal was designed as a kind of two-stage affair. Resistance in the pull increases before the “break” of the shot. Loading the M32 is a breeze. A hook that drops down in front of the cylinder, behind the vertical grip. The user simply pulls the hook forward, unlocking the cylinder. The entire front of the gun swings forward, exposing the chambers. That same hook doubles as an ejector plunger; shoving it backwards will eject the spent cartridges. The aiming system: a red dot sight in an adjustable mount. You change the sight’s elevation depending on the distance to the target (duh). You use a compass on the side of the sight to dial in the proper distance—without the need for a ranging shot. At least in theory . . . The MilKor M32 MGL grenade launcher’s ergonomics are fantastic. The grip is made from a soft and squishy rubber (not official military term). The M32’s buttpad is fully adjustable for length of pull as well as the angle of the stock. The forward vertical grip makes aiming this gun easy. My only complaint: the safety. Like the safety on a KRISS carbine, operating the safety with your thumb WITHOUT moving your hand off the fire controls is a tricky. But possible. The M32 MGL also has a free-floated barrel surrounded by a rail system, to which the user can mount lights, lasers, thermal imagers, GPS locators, etc. The stock folds for added convenience and, like a revolver, the M32’s drop safe. So, how does it feel? It feels like shooting fish in a barrel. Or with a barrel. Of high explosives. That flies through the air and lands on their head. The M32’s recoil is insignificant, despite the size of the projectile, mostly due to its low velocity. As with any weapons system, the MilKor M32 MGL’s effectiveness depends on the ordinance selected, the operator’s skill and the gun’s ability to keep doing what it was designed to do, no matter what. The M32 is combat-proven, which speaks highly of the both rounds and reliability. As for the human factor, experience is key. With enough practice, it’s the M32 is as easy as pie. All ratings are relative compared to the other weapons in the gun’s category. Frankly, I still can’t believe I put two rounds in a trash can at 50 yards without any practice whatsoever. This thing is absolutely dead-on accurate. It’s GIGANTIC, but what would you expect from something that’s basically a Peacemaker that fires grenades? The cylinder release is a little awkward to grab, but the placing makes perfect sense. Not only does it feel pretty natural to hold and shoot, but the “thunk” sound it makes puts a little bit of extra happiness in your heart. I didn’t have enough time to test the reliability, but the design seems solid. Unless the spring breaks or the user forgets to spin the cylinder, this thing should work without a hiccup for ages. There’s some rails, but what more do you really need? Sight? Check. Forward grip? Check. Done. I really really want one, even though I have nowhere to shoot it and no practical application for it. It’s a destructive device, not a machine gun, so I may actually have some hope of the ATF letting me register one. Depends on the specific model and the ammunition. This model claims an effective range of 375 meters (about the same in yards), but that can be extended to around 800 meters with “ERLP” ammunition. Not saying you’re going to be hitting your target at almost a kilometer, but you can hit SOMETHING. spontaneously combustion will never happen. Government or more precisely, the congress and senate, want them doing what they are doing. See, they’ve pretty much decided that they’re going to take over and that comes with certain conditions. Guess which ones. Hint, it’s been done before by foreigners. I handled one at SHOT. They seemed heavy, but it fires 40mm grenades so I guess that that comes with the territory. 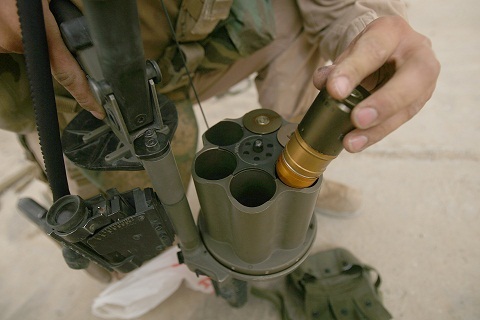 Just remember that each 40mm explosive round is a destructive device with the set full set of paperwork to match. I want an M32 for my collection. And some HE rounds. I think the reviewer was biased by how awesome this thing is. Think the NRA will let us test it in their range? Coming soon to a Mexican drug cartel near you! Courtesy of the Mexican government, the US Dept. of State, and the BATFE! News at 11! American FFL firearms dealers to be blamed! Coming to your community police department soon? Maybe not soon but at the rate local law enforcement is militarizing Iwould think it only a matter of time. our school crossing guards are being issued them . come to a complete stop …or else! Good Day to you all, A few short words as the Sales Manager for Milkor South Africa. After 21 years of continuous use through a war and out, the SA Army still has its original Y2 40mm guns in operation! They are now looking to upgrade to the new SuperSix 40 mm gun (140mm cylinder with gun length of 805 mm) which can fire med vel ammo out to 800 m and last time we demonstrated all fell within 5 m of the target. Clearly all things being equal ie wind etc but each round is deadly within 10 m. 6x rnds covers an area 20mx60 if spread is allowed. ERLP only fires to 600 m.
The gun is perfect for crowd control using the variety of less than lethal ammo avail these days. 6 rnds in 3 seconds reload in 7 if practiced prepared. Thanks.